(Gaeilge) An bhfuil scoil nua le hoscailt i do cheantar in 2019? (Gaeilge) Deis deiridh clárú do Thionól Forbartha 2018 – dornán spásanna fágtha! Click here for information and applications. First ever public event for parents of children with speech, language and communication needs in a bilingual school. A growing number of children in Ireland grow up speaking two or more languages in the home or within the school environment. 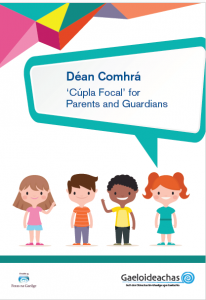 Many parents/guardians have questions, often unanswered, surrounding the use of two languages and also the suitability of bilingual education for children with speech, language and communication difficulties, and with other special educational needs (including autism, dyslexia, dyspraxia and Down Syndrome). Leading experts in this field will address these issues at a public information evening and will seek to reassure parents that bilingual education is a beneficial system of education for children with varying special educational needs. This event, organised by Gaeloideachas in partnership with the Irish Research Network in Childhood Bilingualism and Multilingualism will take place in Trinity College Dublin on the 3rd of May 2018 between 7-9pm and is open to all. Education through the medium of Irish in Ireland, and other forms of bilingual education, is a hugely beneficial system that offers many advantages to children, including communicative, literacy and fluency in two languages, greater confidence and sense of identity, cognitive and increased educational attainment. These advantages are available to all children, including those with special educational needs. Unfortunately, however, there are many misunderstandings and myths surrounding these questions that lead to children being excluded from a potentially advantageous form of education. Perspectives on questions surrounding Irish-medium and Gaeltacht education will be shared by leading experts in the field including: Professor Ianthi Tsimpli (University of Cambridge); Professor Padraig Ó Duibhir (Dublin City University); Dr Ciara O’Toole (University College Cork); Dr Maria Garraffa (Heriot-Watt University) & Clodagh Ní Mhaoilchiaráin, (Principal of Gaelscoil Bhaile Brigín – an Irish-medium school with two ASD units).